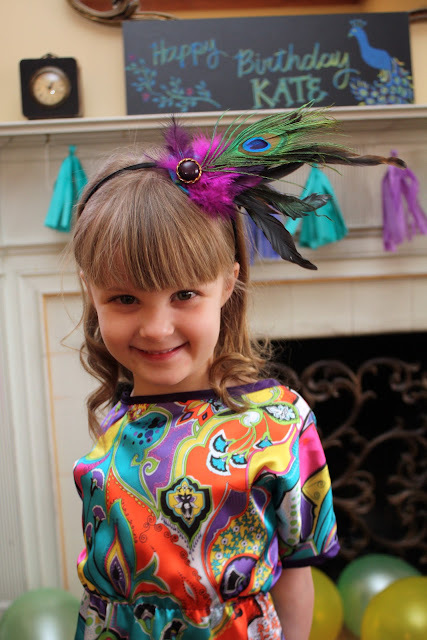 My darling Kate turned 6 yesterday and she requested a peacock theme for the celebration. Honestly I was a little scared when she made the request a few weeks ago. 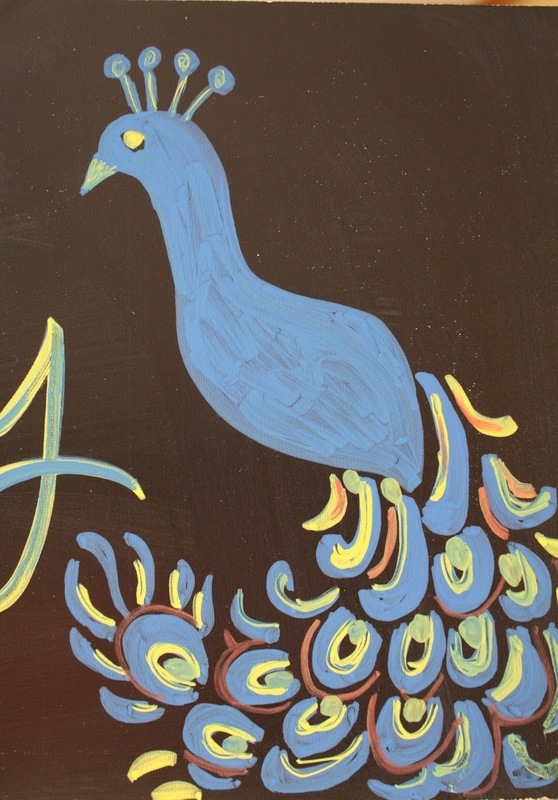 I'd never seen a peacock birthday and wasn't feeling very creative. I've never said no to a request and I'm glad I didn't this time because we were both thrilled with how everything turned out. Once again we celebrated with a simple family dinner and cake, but I tried to make it special. If you look close you can see all the peacockish designs in the fabric. My favorite part of the outfit was her headband. 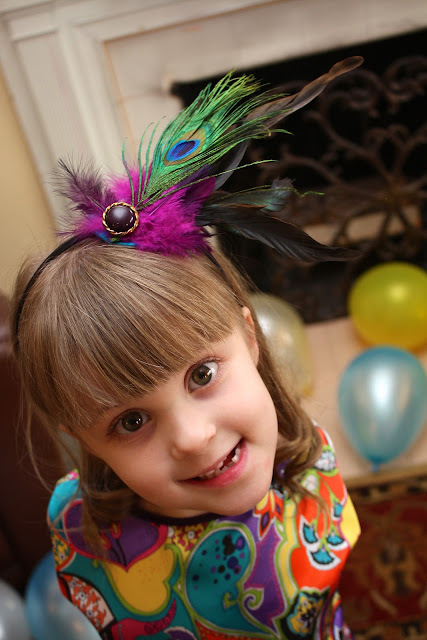 She was so excited to wear a real peacock feather. I was pretty proud of my late night peacock drawing. 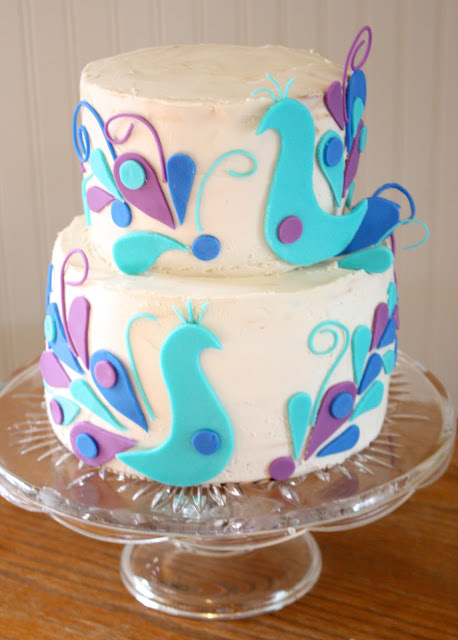 This cake reminded me a lot of the blue bird cake I did a couple of years ago. I love doing fun whimsical shapes on cakes. While Kate loved the outside of the cake, the rest of us were loving the inside. I hate to brag but this cake was pretty dang good. 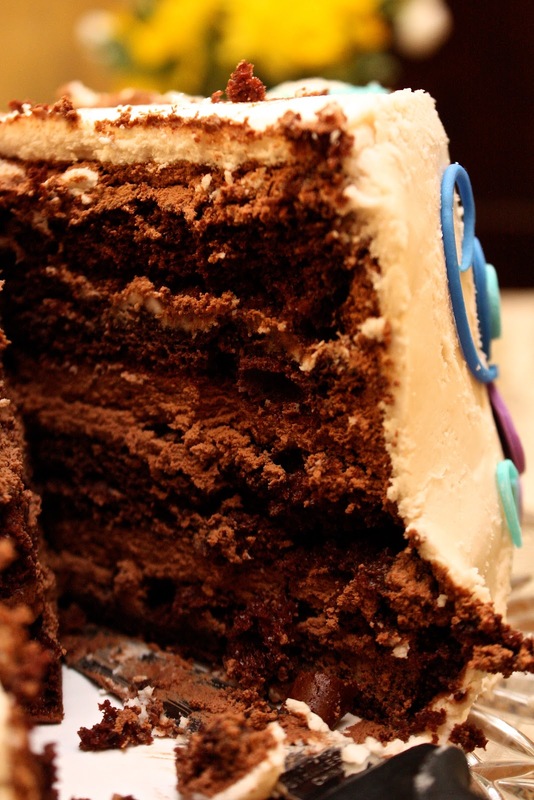 It was super moist with three layers of chocolate ganache inside. YUM. I sure love this girl. I think we are the most alike of all my kids. She is the middle child and kinda takes care of herself. She seeks out attention by doing good things not acting out. Some things I want to remember: She requested Ramen noodles for dinner, luckily I talked her into spaghetti noodles with alfredo. And she came home from school with a birthday present from a boy, her "boyfriend". A peacock theme is so original and fun!! 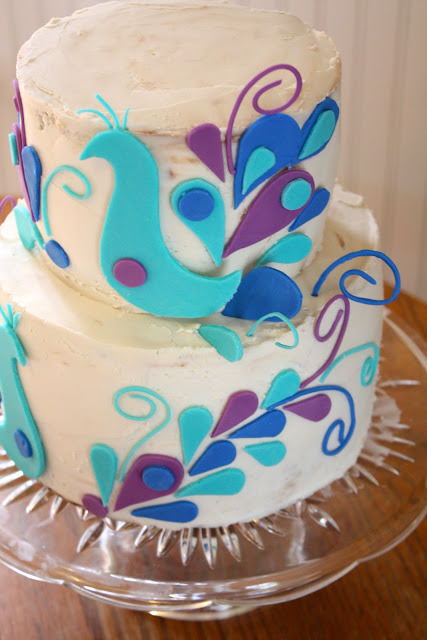 I love all the pretty colors and that cake looks delicious!! Happy Birthday, Kate! You're ahead of the curve here, Doll. I'm pretty sure peacocks are the new owls. My granddaughter LOVES them. Anyway, everything was beautiful. You are so talented. Thanks for sharing with us. 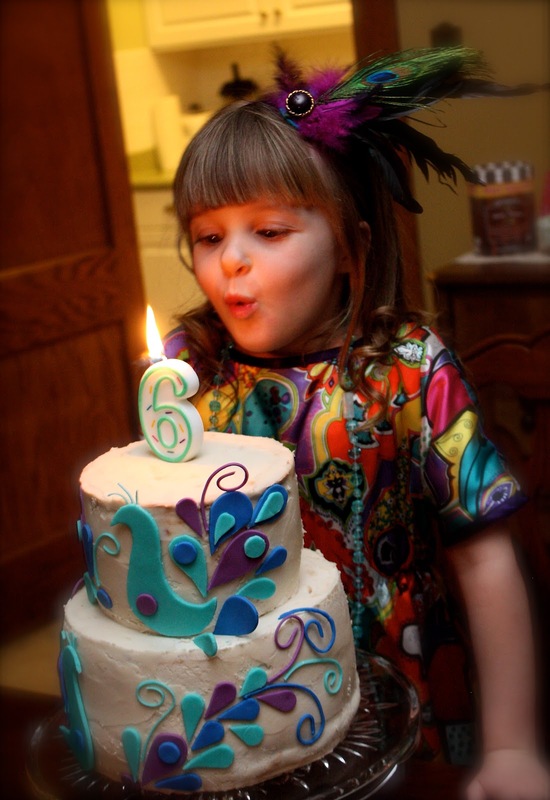 Happy birthday to the 6 year old! What a fun theme and party! Happy birthday Kate! What a fun idea! I love the headband! And your cake is so cute! Thank you for sharing. You have some talent! 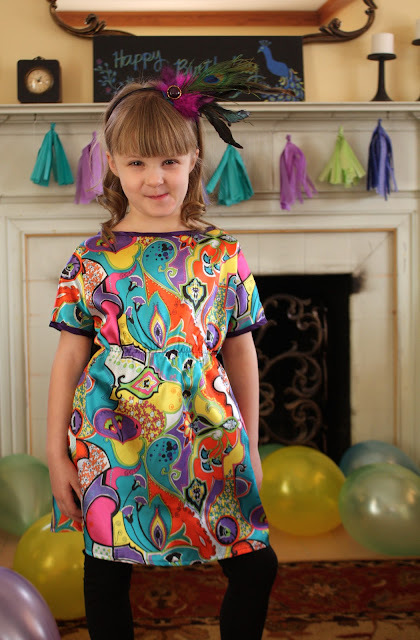 I’d love for you to check out our Pattern Party! Those with free patterns and templates to share are invited to link up! What a lovely blog! Just found you when googling reusing tshirts (saw your hats). Great work!